April is National Youth Sports Safety Month. Over 3.5 million kids under the age of 14 seek medical attention for sports related injuries every year! 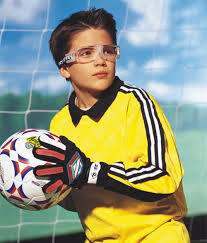 There are a number of things that can be done to either protect the eyes and prevent serious injury or even blindness. The first step is to make sure that your child is seeing well enough to safely play sports. Not every child that wears glasses will need them for sports, but for kids that do need them, sports glasses should be considered. Another possibility is contact lenses - once your child is old enough and mature enough to use them safely. Our doctors regularly fit daily disposable contacts, which simplifies contact lens usage, especially for teens that often cannot be bothered with the responsibilities of cleaning and caring for their contact lenses.